The pioneer congregation at Farmington no longer exists, but we can trace its beginning to the home of Philip and Sarah Harris. They had crossed the plains in 1845 and made Bridgeport their home and are listed among the 1845 pioneers. The first home services recorded are in 1846. Sometimes the church was called Christ Church at Bridgeport. A log cabin building was constructed in 1852. The community evidently changed its name to Farmington because of the conflict with another community named Bridgeport. The new name was probably in honor of Farmington, Connecticut. Stephenie Flora has listed the pioneers of 1845. George W. Richardson reports holding a protracted meeting in August of 1855. H. H. Hendrix had helped get the church underway several years before. Harris began ferry service across the Tualatin River and then built a bridge. The modern bridge at that location today is named in his honor, although one risks their life to read the plaque on the bridge. The community was serviced by steamship in its early days. Like many congregations, the church was restarted in 1863 with "Judge Humphry and wife, Philip Harris and wife, Mr. Richie and others." The reference is probably to Thomas Dabney Humphrey who in 1887 became an elder at the Hillsboro Christian Church. T. D. and Elizabeth Ann Humphrey are buried in the Hillsboro Pioneer Cemetery. They came overland in 1847. Other members of the church included Robert A. Carpenter, David Campbell and Peter Scholl, a trustee of the church. The town of Scholls, south and east of Farmington bears his name. G. W. Richardson was the first minister to devote his full attention to the ministry of the Word at Farmington. His uncle, Nathaniel (Natty) Carpenter Richardson, farmed near town and that may have been the connection in getting G. W. Richardson to this location. Others following were H.B. Morgan and James A. Campbell who grew up at Farmington and began preaching there at 18. These preachers were all pioneers themselves, having traveled the Oregon Trail. Baptisms were in the Tualatin River near the church building. The log building was replaced by the building pictured in 1882. A note in the 1889 Christian Standard reports a successful meeting held by George P. Rich. Twelve additions were reported. The scattered "old timers" continued to return each summer for the annual picnic in the Christian Church park as recently as the 1960's. Today the church building and park have been replaced by a garden plot. No trace remains of the former days. Pioneer Reminder: The Philip Harris Bridge on Highway 10 at Farmington. Hillsboro is named in honor of David Hill, one of its earliest residents and a leader in the Oregon Territory. The post office was established in 1850. Dr. Swander had records of a congregation in Hillsboro in 1853. It may be that Harrison Hendrix, a pioneer of 1852 was involved in these earliest years. Two reasons we believe this are that his wife was Zerelda Jane Pedigo Hendrix and when the church had its formal beginning in 1862, two of her brothers were among the charter members. Also, there are 30 additions reported from Hillsboro, Oregon in the 1855 edition of the Millennial Harbinger (page 117) due to the work of "Brother Hendrix." Sometimes, there was preaching and there were conversions before the believers were organized into a permanent body. The Christian Church of Hillsboro date themselves from 1862 when church planter John Ecles Murphy organized a group of believers meeting in the home of Amanda Perkins at Third and Baseline Streets. Her house was moved and a church building erected there in 1887. It was the first church building in Hillsboro. They were originally named the Church of Christ. One record says that building plans were first made in 1877 for a building with a seating capacity of 300, the main building being about 34 x 52. Added to that were dressing rooms and vestibules adding about 10 feet on both ends of the building. It appears that the first building was actually put in place about 1887. The 16 charter members were: William T. and Sarah Blaine Barnes, Clarinda Beal, Michael Boyd, Nancy A. Boyd, Mary E. Moore, William Evermont and Sarah Ann Hannah Pedigo, Edward Axel Pedigo, George H. Smith, Margaret Smith, David Snodgrass, Perrin Steeples, Mary Steeples, Lurana Tucker, and Susan J. Tucker. Shortly after the church was organized, these added names appear as leaders: Charles J. Bullock, Isaac Butler, A. T. Crocker and W. W. Watson. Pioneer preachers who came over the Oregon Trail included Murphy, George D. Richardson, Neal Cheetham, James A. Campbell, George P. Rich, Peter Burnett and H.M. (Mac) Waller. The first baptism was that of Katherine Towner in 1863 and the second was that of Isaac Butler. This Washington County congregation celebrated its centennial in 1982, having been established 100 years earlier. The first preacher was Peter R. Burnett beginning in 1883 followed by James A. Campbell in 1886. The group built their first building in 1891 and it was dedicated February 7, 1892 by David Wetzell of Portland and W. F. Cowden of Tacoma, Washington. The church grew rapidly and added a large section on the side of the photo away from the camera. There was a daylight basement as well as two stories above ground level. The new unit included ample classroom space. While Hodges was in Glencoe, OR (Aug 1882 - at least Spring 1883) he worked with a congregation at Shady Brook (two miles north of Glencoe). The congregation was meeting when he arrived in August but the members were from all different denominations and no one was leading. After working with them for some time he organized them on the Sunday before 2/26/83 as a Church of Christ. They were going to elect officers on the third Sunday in March. Evidently this congregation did not survive long after Hodges left. This site is close to the Pumpkin Ridge Golf Course. The church building used by the group is still visible in the trees on Jackson School Road, east of Shady Brook Road. Local historians say this is the only church that has ever been in the area. The building is not in regular use now. If that building was not in use when Hodges preached there, then they met in the school house that stood at the intersection of Shady Brook and Jackson School Road. Pioneer Reminder: The church building in the forest. Named for mill-owner and businessman Joseph Gale, this once bustling community was host to a congregation established in the spring of 1887. The town, nestled in the foothills of the Coast Range, was the last stagecoach stop on the way to Tillamook. The church was established by James A. Campbell who agreed to include Gales Creek in his monthly preaching circuit for one year. During that year, at least 18 on the list below were baptized into Christ. Members during 1888-1889 were: Mr. John (probably W.) Corum (from Missouri in 1887); Sarah Corum (Missouri, 1880); Lula Corum; Pevy Corum; Mrs. Anna Allen (Kansas, 1883); Mrs. F. P. Barrette; Anna Christian; Dianna Christian; Mattie Christian; Mr. C. P. Christian; Mark Cox; Miss Ada Cox; J. R. Dallas; Mr. John Dallas; S. S. Dallas; Emma Fletcher; Miss Nellie Fletcher; Mr. William Fletcher; Mr. John Fletcher; Mrs. Edna Fletcher; Ellen Godfrey; Max Godfrey; Mr. Elvin Godfrey; O. T. Hubbell; Mr. John Lewis; Mrs. Martha Lyda; Miss Jennie McCoy; Mrs. Hattie Morr; Mr. Channahan Omer; Frank Powell; Mr. (probably Anson) Powell; Minnie Seamans; Frank Sellman; William Stephens; and Ward Swope (Missouri, 1886). It is possible the church met in either the school house or a facility known as the Union Church building. Their records stated they met each Sunday for the "sacrament" at 10:00 a.m.
A note in the church records states that Brother Campbell has been coming for a year and will discontinue his appointment here. That would have been about 1888. 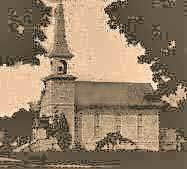 This is to certify that the church at Hillsboro, Washington County, Oregon, by request of Gales Creek Church, same county and state, met to ordain S. S. Dallas to the office of Evangelist, both the candidate and officiating parties having duly prepared themselves for the occasion by fasting. Therefore Nov. 1st, 1888 at the hour of 7 o'clock P.M., he was solemnly set apart to the ministry of the Word of God by prayer and the imposition of the hands of J. A. & David Campbell in the presence of Church assembled. -- J. A. Campbell, T. D. Humphreys, David Campbell, J. H. Patterson, Elders. -- J. T. Stewart, S. D. Powell, Deacons. -- W. H. Rucker, Clerk. The signers include James A. Campbell who preached in Oregon for nearly 50 years, Thomas Dabney Humphrey and Steven Dodridge Powell, son of John and Savilla Powell of Albany. All of these were overland pioneers. The church came in to Hillsboro for the ordination because they did not have elders of their own. Gales Creek officers were John W. Corum and Anson Powell as deacons with Mark Cox as clerk of the church. 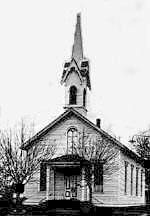 The church was still meeting five years later because historian Clarence Swander lists the Gales Creek Church in the records for 1893. Sometime following this, the church apparently disbursed. Our thanks to local historian Joyce Sauber for locating the records of the Gales Creek Church of Christ.